Savage River Lodge is completely surrounded by more than 700 acres of State Forest lands. We offer a rare brand of privacy, unparalleled relaxation and a myriad of opportunities for fun. Savage River Lodge is an unforgettable experience! Here's what luxury looks like... when it's relaxing. Seriously, no shame, just a feeling that you've done something very right! And so have we! Our critics have been generous with acknowledgment and awards for our extensive and impressive wine selection, and our ability to maintain sustainability and green-ness in the tourism trade. From "Finest Spa & Couple's Getaway" to "Finest Dessert" and "Finest Fine Dining" by Maryland Life Magazine in 2011 and 2012. Now that makes us proud! The restaurant at the Savage River Lodge is a popular destination for both our overnight and local guests. We bring creativity and a passion for great food to your table. Our style is New American Classics, and our menu features dressed-up comfort food...all in a casual setting. Our dishes are freshly prepared, delectably seasoned, and often cooked in our wood-fired brick oven. It's a unique atmosphere...peaceful, relaxing, inviting. In the warmer months, dine al fresco on our expansive covered deck and in the winter, cozy up to the fireplace with an after-dinner cocktail. Add excellent food, an award-winning wine list, and the Lodge's extraordinary hospitality, and you'll be back again and again. Developing our award-winning list was a challenging process due to our location...not just in rural Western Maryland, but our "off the beaten path" location, a mile and a half from the "paved" road. Our goal was to develop a list of quality wines at affordable prices, from suppliers that would actually bring their trucks to our door. We think you'll be pleased with the selection. Wine Spectator magazine has awarded us its Award of Excellence annually since 2003. We have also earned Wine Enthusiast "Award of Distinction". Soak it in. This is where morning makes it's big entrance and, wow, what a show! Inviting rocking chairs beckon you to sit and enjoy the view. Built largely from sustainable lumber, The Lodge is an open architectural pleasure; form unites with function and makes a comfortable chair and a book in the library loft that much more special. It's a common space for guests that feels like their own but warmly overlaps with the space of others. It provides a central meeting place for connecting with each other... with limited Wi-Fi and boasting views of an unforgettable sunrise, perfectly timed each day for admirers of mountain Maryland skies. ... it is in the forests that men have grasped the first idea of architecture. Our eighteen private cabins are a step beyond typical. Two stories of cozy comfort with architectural details of a stylish lodge retreat. All eighteen cabins provide an exceptionally warm living space that blends seamlessly with the surroundings. Once inside, you'll do the same with furnishings designed to welcome and relax. Surrounded by the sounds of the forest, the yurt's central skylight has an undeniably "centering" effect... soothing and serene. 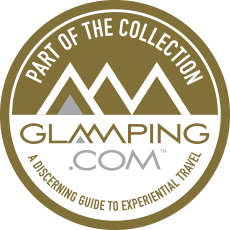 We have eight opportunities for taking your leap into the restorative art of Glamping [glamorous+camping], each with its own unique design accents. Take virtual tours of some of our features, from THE LODGE, to a sampling of a TRAIL, or a CABIN or YURT.